It is almost always intimidating to me to work with handspun. Whether it’s mine or spun by somebody else, I find myself paralyzed with anxiety. After the immediate fear of working with handspun yarn, the joy and pride I feel when I wear a completely hand-made item washes all of those fears away. This fear makes me very picky about what project I choose to use my handpsun with. This scrutinizing mind was ruthless when thinking about ideas for my handspun ombre yarn. This yarn was special not only because it was handspun, but also because it was blended by hand. It is particularly important to swatch when working with handspun yarns. When many hours of work have already been put into a project and many more hours ahead, no amount of wasted yarn is worth jumping in without looking first. This preparation helps alleviate that initial hesitation when picking up that hank of yarn. I knit, wove and crocheted swatches with this yarn just so I knew how the yarn interacted with each craft. After looking at all of them, and feeling the drape, I chose to knit with my yarn. I mulled many ideas around in my head for some time until I settled on the idea of a shawl. I knew that I wanted to make a simple project, something that you could do with very little thought and had the ability to be set down and picked back up again. I also knew that I didn’t want too much texture or pattern that distracted from the beauty of the handspun yarn, so a stockinette stitch dominated pattern was ideal. After I determined the basic framework of what I desired, I teased out the design further by punctuating the stockinette sections with yarn-over feather motifs that run down the whole length of the shawl. At this point, the Pulsar Shawl began to to take shape. The slight variations in the colors and the drape of the knitted shawl is simply decadent. I am very pleased with this pattern and will enjoy it for a very long time, knowing what all went into it. 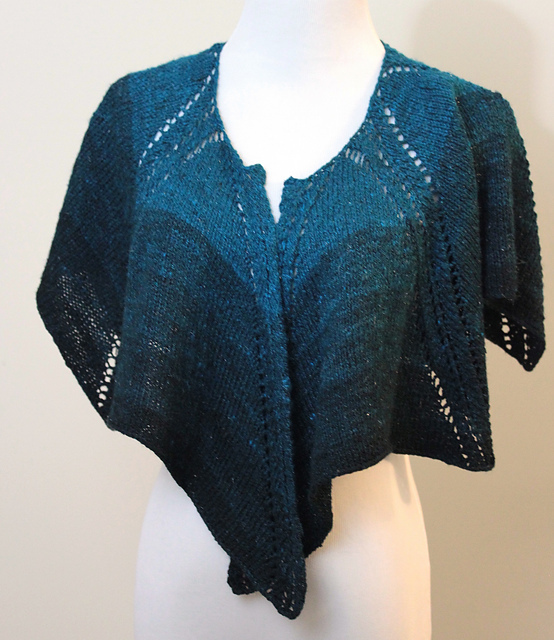 I always try to showcase my handspun yarns, and with this versatile shawl I think I succeeded. I hope this inspires you to pull out your own yarn and make something with it! Share your projects with us on our various social media platforms!